Villa Ansellia is a cluster of about 2 pavilions that epitomizes the aesthetic blend of traditional Thai architecture and contemporary tropical elegance. Interiors are appointed with finely finished as well as woven wood furnishings accompanied by modern and luxurious pieces. Amenities are discriminatingly five star – for all-out guest delight and enjoyment. 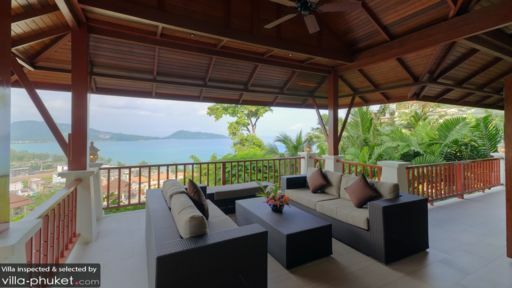 Constructed on a hilltop above Patong Beach, Villa Ansellia affords you exquisite vacation living with a truly highland ambience. The villa has four bedrooms. Two master bedrooms are on the ground level of the main pavilion. These bedrooms have king-sized beds, as well as dedicated bathrooms with fitted bathtubs and rain showers. Both master bedrooms open out to a long balcony with magnificent views of the seascape. One other bedroom is on the ground-level annex of the main pavilion below the sala, while one more bedroom is on the ground level of the villa’s second pavilion where the media room is in. These bedrooms have twin beds convertible to double beds, as well as dedicated bathrooms with rain showers. Both bedrooms have direct access to the infinity pool. The centerpiece of the property’s exterior is the infinity pool. Dip into its beckoning, glassy waters which appears to ebb with the tide back to the Andaman Sea. Then, ease your aching muscles in the bubbly, heated waters of the jacuzzi under the shade of the elevated sala just behind the swimming pool. If you wish to bathe, instead, in the sun, you can lie on cushioned, wooden pool beds partially covered by large umbrellas on the poolside stone deck. As guests of the villa which is part of the L’Orchidee Residence complex, you all have exclusive access to the estate’s swimming pool – a portion of which is for children. On the breezy top level of the main pavilion are two living areas. One is indoors, while the other is out on the balcony overlooking the ocean and the infinity pool area. Around the large and long, modern as well as woven wood sofas, you can all converge for moments of family or friendly bonding. Adjoining is the dining area with its long, dark wood table good for 10. Here, you can all have your fill of authentic Thai specialties – as well as foreign fare – freshly cooked by the onsite chef at the fully-equipped, ultra-modern kitchen behind the dining area. Additional seating is also provided by a complementary high table. The indoor living area also opens out to another sala where you can spend some me time. On the top level of another pavilion is the media room where you can anticipate the new episode of the latest blockbuster series, relive the drama of your most beloved classic movie, or level up in your favorite video games. You’re also entitled to free use of the estate’s gym – so you can still do your regular exercises even while you’re on vacation. In charge of carrying out the day-to-day services of the villa is a staff led by a manager supported by a personal guest assistant, a pool attendant, a gardener as well as housekeepers and security personnel. Aside from the chef, a babysitter, a driver, a laundry helper and a spa therapist may be called in upon your request. Their services, however, come with a separate charge. Scooter, car and boat rentals are also available. Included in your booking is shuttle service from your villa to the estate’s entrance and back. 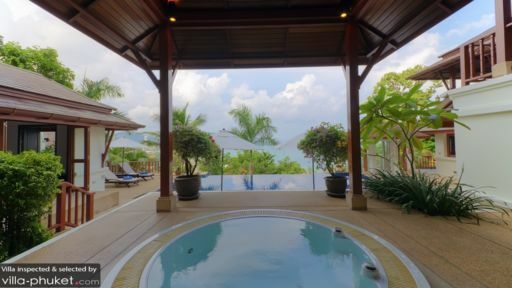 Villa Ansellia is located in Patong – a bustling beach town on the west coast of Phuket. Just a ten-minute walk from the villa is Patong Beach – the go-to destination in Phuket. Spend the day combing the three-kilometer shoreline then head to Freedom Beach where you can go sunbathing and snorkeling as well as play beach soccer and beach volleyball. Hop to Paradise Beach for a swim, and if it’s a full moon that night, you might as well stay on for the Full Moon Beach Festival – Phuket’s biggest beach party. Since you’re already in a water fun mindset, you can, on another day tour, go wake boarding at the Phuket Wake Park, then learn how to surf at Surf House Patong. Stop by the Patong Go-Kart Speedway for some go-kart racing as well as by the Patong Boxing Stadium to catch some Muay Thai action. On your next day trip, go ziplining above Phuket’s rainforest at the Flying Hanuman, then go on a refreshing trek at Kathu Waterfall. You must also experience firsthand Patong’s festive party zone – Soi Bangla, as well as see a live, colorful and extravagant performance at Simon Cabaret. Every aspect of our stay was extraordinary: the villa itself is very spacey and nicely decorated, service is second to none. Special thanks to Villa Director and Manager - Stephan and Geoffrey, who exchanged over 70 emails with me in arranging our stay, providing recommendation and arranging the surprise birthday party for my friends. We have got a DJ and a cook arranged by the villa for the party. Heartfelt thanks and we had a GREAT party! Of course, the pool in the villa, the view (I stayed in X1) and the location are very nice (5 - 10 mins ride to the town). 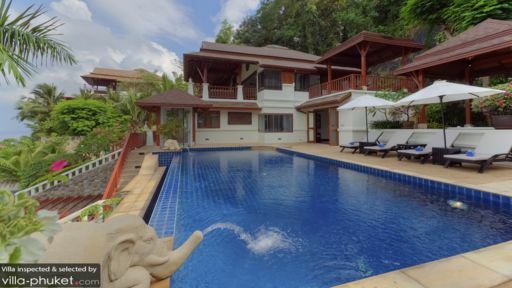 I strongly recommend this Villa to anyone who would like to find a Villa to stay in Patong. Absolutely fantastic! I stayed in X1 at the upper hill which has an amazing view, the villa is comfy and clean. And, I love the swimming pool!! Especially thanks for the great help from their staff - Geoffery and Stephen for arranging everything we need, our stay was made even better by them. Will definitely return. We have stayed at L'Orchidee Residences twice now, July 2010 and July 2011. So we must like it to have come back twice!! Views are beautiful, and the villas themselves are big and spacious. We have stayed in villa K12 and villa A3 and both are magnificant. The staff are attentive and responsive. We had a few issues day 1 and they were all dealt with promptly and resolved. The Villas themselves have dated in the 12months since our last visit, and we noticed more scratches on the floors. In the wet areas, the slate floor when it gets wet, does tend to peel off slight so probably needs a re seal! I would also recommend a towel and linen update as the sheets and towels are thin and feel old, I would expect thick fluffy towels in such a beautiful villa. The outdoor furniture around the pools also does need an update, but none of this detracted from our stay and we still loved it, even when it rained. Well worth the visit, and we will be back for sure in 2012. Copyright © 2019 Villa-Phuket.com. Call us in Thailand +66 60 003 5911 / Australia 1300 014 384 or +61 2 9191 7419 / Singapore +65 6871 8993.